This shortened malt pipe will enable our 50L Braumeister to brew 25L batches (from 10 gallons to 5 gallons). The way these Braumeisters function during the mashing stage, a smaller batch than 50L is usually not an option. By utilizing this shortened mash pipe, you can now brew either a 5 or 10 gallon batch with your 50L Braumeister! This is a great addition to the Braumeister - 50L system. When I'm playing with different styles I use this so I don't have to commit as much grain to an experimental batch. I generally have to start my mash with 26L of water in order to keep the heating coils completely submerged. I have had the bottom pegs get caught on the heating coils before. I simply removed them and sparge in a separate container. while i enjoyed brewing the full batches on the 50L braumeister, the shortened mash pipe has been a welcome addition. Works great with the setup and has presented no real issues or problems. 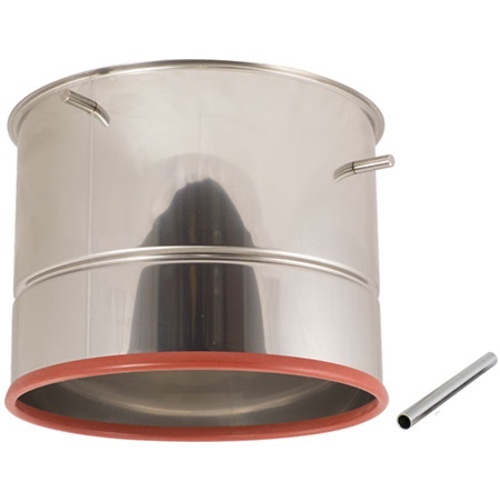 you will need to use the screens and perforated metal pieces that come with the full size malt pipe/50L bm. what you see in the item description is all you get. I've found that with certain grain bills the pumps can be run dry using the shorter malt pipe. Watch grain absorption or put more water than instructions recommend with slightly longer boil.